Ash Wednesday is not actually a holy day of obligation, but more people probably show up for Ash Wednesday Mass than any of the other holy days of obligation. Just like the 4th Sunday before Christmas is the start of Advent, Ash Wednesday is the start of lent, and lasts 40 days (the 40 days do not include Sunday’s because they are considered days of celebration of the Sabbath, even though the Gloria is not sung) before Easter Sunday which marks a time of repentance, penance and forgiveness. It is a time of preparing ourselves and our souls for the greatest sacrifice of Christ on the Cross on Good Friday, his death and Resurrection on Easter Sunday. We receive ashes on our foreheads to remember who we are; sinners who will receive the punishment of death because only those who are pure of heart and soul are worthy to be in the presence of a Holy God. Seems dark and pointless, huh? Here’s the secret: If we turn away from our sins, repent, ask for forgiveness through Reconciliation, do our penance, and love God, Jesus and the Holy Spirit with all of our heart, all of our soul, all of our mind and all of our strength, we will receive eternal life! This is the promise God gave our Israelite ancestors, His Covenant to send His Son to take the weight of our sins from us, covering our sins so that God only sees the perfect sacrifice of His Son. God always keeps His promise, and His Covenant can not be broken. Go to Mass on Ash Wednesday, and then follow through with giving up a sin and doing penance for that sin for those 40 days. This is a big upgrade, but come Easter Sunday, you will come to understand who you are in Christ. You will know you are forgiven. You will know you are loved by God. You will feel the love of Christ’s death on Good Friday – and the death of your sin. 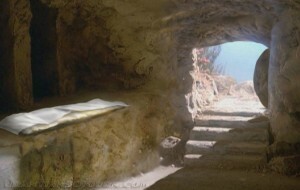 You will celebrate His Resurrection, just as His apostles did when they found the empty tomb . You will receive ETERNAL LIFE with God. Although we will all still have to pass through death (at least until Jesus returns), we can feel confident that we will NOT die eternally but will be reunited with God, with all the Angels and saints, and all those who passed before us in love God. FOREVER. AMEN.